The sturdy design of the One Stop Single Sided A-Frame prevents tipping. Rubber strips are mounted on the bottom and back supports to prevent slippage. It comes with two ratchet securing bars to hold the slabs in place. The quick release mounting pins change the A-Frame from mobile to stationary using the four provided casters. 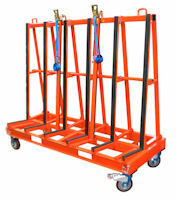 These removable casters allow for easy transport around the warehouse or site. Space is provided on all base sides for forklift transport. The collapsible design saves on freight costs, yet it is easily assembled.